I loved how this Valentine's Day wedding cake was crawling with thorny vines and overflowing with deep red sugar roses. 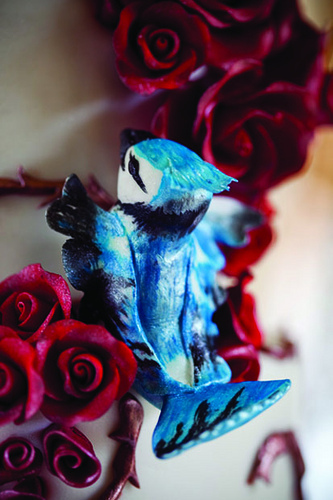 The bride had a custom designed ring of two tiny blue jays so they wanted to incorporate the blue jays onto the cake as well. They were made of sugar and hand painted. Thanks to Sabine Scherer Photography for coming to my studio to take some shots.